Adafruit customer service forums • View topic - Snap a picture of your ADAFRUIT clock and post it here! Re: Snap a picture of your clock and post it here! It started as a test for the LED matrix driver, but then I decided to just carry on and finish it. It keeps time perfectly but still needs a few things doing. I need to add some buttons for control (multiple fonts etc), an LDR to dim the display at night and a radio time module (probably GPS because MSF and DCF77 reception here are terrible). I am also working on a nice case for it. The LED matrix is driven by shift registers with Darlington arrays to sink the required current. Rather than using resistors I instead used LM317 regulators to generate the forward voltage of the LEDs, plus a bit extra because they are multiplexed. I use another shift register and some transistors to switch the LM317s on in turn, one for each row. There were some issues with the brightness of the display not being quite even. A better power supply mostly sorted them out, but to remove the last imperfections I adjusted the display scanning interrupt to count the number of lit LEDs per row of the display. Rows with more LEDs get a slightly longer time slice to increase their brightness. It seems that the LM317s rise a bit more slowly when there is a larger current draw. I'm not sure if it's the regulators or the PSU, probably a bit of both. Last edited by florinc on Wed Mar 03, 2010 1:38 pm, edited 1 time in total. 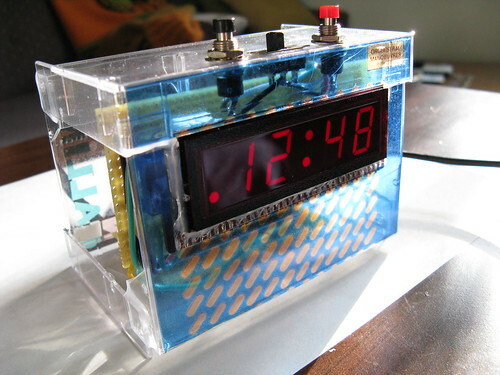 Re: Snap a picture of your ADAFRUIT clock and post it here! Put it together last night, but had to wait until this morning to finish, as my kit was missing a 2.2k resistor. It's cool, I know a guy. Not bad for a first time builder, I knew I bought this iron for something! I'm looking forward to my next project. Snapped the picture within 3 hours of unboxing! Which accounts for the strange look of the chip. A little brain surgery and It's talking to a programmer. But turn it into a clock. I've recoded the firmware for turn it into a hexadecimal clock. Turn off the sleep mode and power over usb. I had to buy an extra chair for Tux (my kitty) when I'm working. He still prefers whatever chair I'm in, so we trade chairs a lot. Every time I get up to get a part, he switches chairs. Put mine together last night and love it! I may start making these as gifts for people. No modified firmware yet but I may do that next. Here's my collection of photos taken during my MONOCHRON build. This is real DIY Open Source Hardware. Thanks a lot! 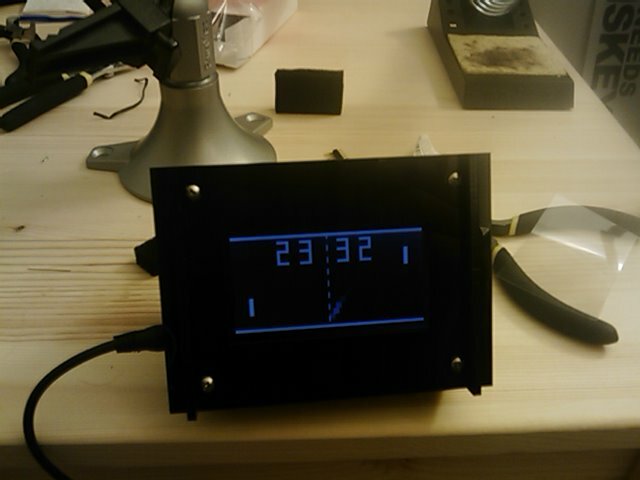 The bottom clock is made by Jan Borchers from The Media Computing Group at RWTH Aachen University. Its name is "The Clock" and it's a study in human design. 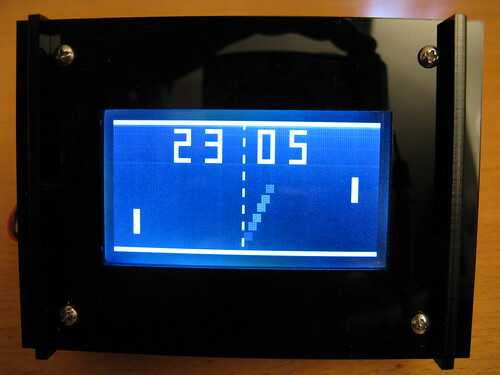 This clock is amazingly easy to control. Just one turn-switch with push function controls time and alarm setting, also alarm on and off. The alarm time settings circle through 15 minutes steps. When the alarm starts it starts randomly with one of 10 songs / noises (birds, ocean, songs etc.) starting with a very low volume which rises up (conscious no snooze function). Also it has an auto dimming function. It's driven by a real time chip and two Arduinos. 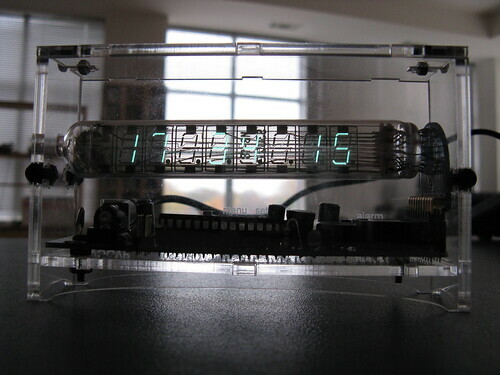 One Arduino controls the digits, user inputs and the second Arduino, which is coupled with an Adafruit Wave Shield and just has the function to play songs and noises. Isn't it a real nice clock?